Kitty Ferguson was born in San Antonio, Texas. She studied at the Juilliard School of Music in New York and was for many years a successful professional musician, conducting and performing oratorio, early music and chamber music. In 1986 she moved to England where her husband was a Visiting Fellow and later Life Member of Clare Hall, Cambridge University. During this and many subsequent periods of residence at Cambridge, Kitty Ferguson audited graduated lectures and seminars in the Department of Applied Maths and Theoretical Physics and got to know some of the legendary figures in those fields, including Stephen Hawking. In 1987 she retired from music to devote herself full time to writing about science. 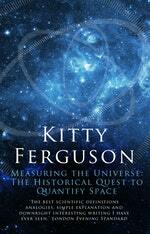 Be the first to find out about Kitty Ferguson.